Life in the March household is full of adventures and accidents as the four very different March sisters follow their varying paths to adulthood, always maintaining the special bond between them. Sensible Meg, impetuous Jo, shy Beth and artistic Amy each have to confront different challenges as they grow up together and attempt to learn how to be both happy and good. "Deals with life's big questions - love and death, war and peace, and ambition versus family responsibility - in a way that is inspiring and realistic. Use a hankie as a bookmark - tears are guaranteed"
Louisa May Alcott was born on 29 November 1832 in Pennsylvania. Her father was friends with Ralph Waldo Emerson and Henry Thoreau. Alcott started selling stories in order to help provide financial support for her family. Her first book was Flower Fables (1854). She worked as a nurse during the American Civil War and in 1863 she published Hospital Sketches, which was based on her experiences. 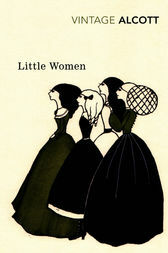 Little Women was published in 1868 and was based on her life growing up with her three sisters. She followed it with three sequels, Good Wives (1869), Little Men (1871) and Jo's Boys (1886) and she also wrote other books for both children and adults. Louisa May Alcott was an abolitionist and a campaigner for women's rights. She died on 6 March 1888.